IF YOU’RE ONE of the nearly 2 million people who live in the Greater Dublin Area (around 40% of our population), chances are you have your own preferred way of getting around it, whether it’s on foot, tyres or by tram. So it’s essential that we have the kind of transport that can cater for such a significant number of people. During the next decade, BusConnects Core Bus Project seeks to overhaul the transport system by creating 230km of bus lanes and 200km of cycle track along 16 of the busiest routes in the city. But first, here’s a look at how we currently get around in the capital. According to the latest census, some 21.5% of commuters choose to use public transport to get to work, compared to 8.5% in Cork city and suburbs. Similarly, two thirds of all cycling commuters work in Dublin city or suburbs, accounting for 7.6% of all commuters in the city. 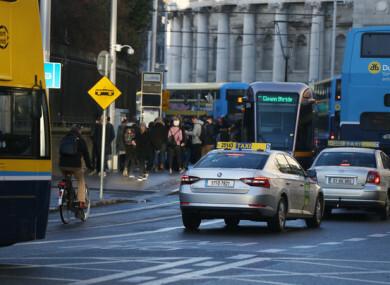 While the average commute time nationally is just under the half an hour mark (28 minutes), people living in the counties neighbouring Dublin have the longest commuting times, usually into the city. For these, it currently takes nearly 35 minutes to get to work. In 2016, the number of people the number of people working in Dublin city and suburbs surpassed the half a million mark, giving the city a daytime working population of 512,449 commuters. The city also experienced a 10% increase in commuters since 2011 when the last census was taken. Nationally, around 111,436 workers around Ireland use the bus, which is the highest increase in bus use in over 30 years and in Dublin, 13.6% of us use the bus to get to work. We’re also the least likely in the country to use our cars to get to work – just under half of those in the city and suburbs drive to work, compared to 76% in rural areas. When we consider the average length of our journeys to work, people living in Fingal (33.4 minutes) was slightly higher than Dun Laoghaire-Rathdown and South Dublin (both 30.6 minutes). Workers in Dublin city have an average commute of around 28.9 minutes. Speaking of Fingal, the area accounts for the largest number of those who commute to Dublin city or suburbs (28,641 commuters). But the largest ‘feeder town’ to Dublin city and suburbs was Swords, where nearly 8,000 of the 20,000 workers who live there commute to work. It’s not just workers that travel to and from the city and its suburbs everyday – college students also need to get around each day. And within Dublin city and suburbs, almost half (45.2%) get public transport, the most popular option. And over a fifth (23.8%) of them walk to college, with 16.5% driving there. Nearly 20% (16%) of students in Dublin city and suburbs travel for over an hour to college, compared to 2.7% in Galway. There are seven towns with populations over 1,500 where over half of resident students take over an hour to get to college including Skerries, Wicklow, Rathdrum, Athboy, Greystones, Kilcoole and Blessington. Want to be a part of shaping statistics about the way we get around in the capital? BusConnects Dublin is a 10 year investment programme to deliver more efficient, reliable and better bus system and they’re currently looking for your insights for their Core Bus Corridor Project in Lucan, Swords, Blanchardstown and Clongriffin. Email “8 fascinating statistics about the way we get around in Dublin”. Feedback on “8 fascinating statistics about the way we get around in Dublin”.